One of the reasons work life balance is so difficult for physicians is the missing “OFF” switch on our doctor programming. 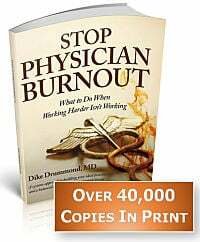 You are trained so thoroughly over such a long time how to be “ON” as a doctor that your physician programming dominates your entire life — running continuously both at work and at home. Work life balance can begin only when you are able to shut that doctor programming OFF – something we were never taught how to do in medical school or residency. 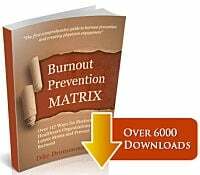 In this post I will show you how to build your own personal “OFF” switch to your doctor programming and get the daily dose of work life balance you must have to prevent physician burnout. On the way home the hassles of the day kept repeating themselves in an endless loop in your mind. You walked through your front door to be welcomed by your family, even the dog is wagging its tail. You flop down at the dinner table and eat for the first time today … and the tape in your head just keeps on running. Your eyes are open, you are looking at your family as they talk to you … and you realize you are not there. The little voice in your head is wondering if you prescribed the right dose for Mrs. Kowalski and can’t remember if you told your partner on call about Mr. Yee’s delirium the last time he was in the hospital. Does any of that feel familiar? Here’s why it happens. We are all trained on how to practice clinical medicine. Along the way we are conditioned to be a workaholic, superhero, emotion free, Lone Ranger. These skills and programming work very well to produce an effective and efficient doctor, but they were never intended to be used outside the clinic or hospital. Imagine the coming home scenario above if you were like “Data” on Star Trek and there was a little switch in the back of your head that would “turn the doctor off”. You flip the switch when you leave the office and all your doctor cares and worries are dropped until you turn the doctor back on again the next day. With your doctor “OFF” switch you can be completely present with your family and your own personal needs and desires. Flipping this “OFF” switch is the first activity in creating any work life balance. 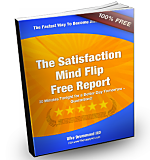 You can install your own “OFF” switch … here’s how. It is called a “boundary ritual”. Boundary rituals mark the invisible boundary between work and home … that place where work life balance is supposed to begin. The challenge is this boundary and the “OFF” switch it relies on are invisible until you create them for yourself. It would be nice if you had a mandatory “un-doctoring” process on the way out of the office. Imagine you change out of your doctor uniform, wash the doctor off, punch out on the time clock and walk to your car under a massive sign that says “No Doctoring Beyond This Point”. Until that happens … it is up to you to create your own boundary ritual … a specific action you take at the boundary between work and home that sends an “OFF” signal to your conscious and subconscious mind. This ritual is something you design and practice with the mindful intention that it will switch off the parts of your doctor programming that don’t serve you when you are away from work and stow away the stresses of this day until you return. As you turn the doctor off the possibility of work life balance is turned on. 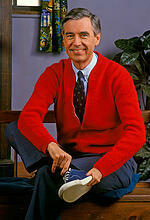 That's right, it's Mr. Rogers. We don't know who he is before the show begins. However, when he walks in the door and onto the set and does three things ... he becomes the Mr. Rogers we know and love from that point on. Those three actions are his Boundary Ritual. Remember what they are? and sings that song. "It's a beautiful day in the neighborhood, a beautiful day for a neighbor would you be mine ..."
Now you don't have to change clothes and sing a song to build your off switch. AND at the same time it is very important to design and practice a boundary ritual for yourself ... so you can turn the doctor off, come all the way home and begin to recharge. Your boundary ritual ideally contains as many sensory modalities as possible. The four big ones are a movement, a sound, a feeling and an intention. => The intention is to put doctor on pause until you need him/her again … hit “OFF” until you need to hit “ON” next time. Practice your ritual with mindfulness and a clear intention to release, relax, let go and turn the doctor programming off. You can even say to yourself (or out loud) a short phrase like, “I release the doctor until the next time he/she is needed”. => Before you sit down and talk with your family, take a shower and/or change your work clothes for home clothes. => Take a deep cleansing breath, sink into your seat or give yourself a whole body stretch and an audible sigh as you release the cares of your work day. => When you get home you go for a short walk around the block before going in the door and practice using your steps to release work and come to the present, preparing to be with your family. ~~ What would you like to use as your first pass at a boundary ritual? ~~ What will you use as your trigger to help you remember your ritual? ~~ When will you try it out? Remember too that building your own “OFF” switch and creating true work life balance is a process. Think about how many years it has been since you first entered medical school … go ahead and count them up. That is how long you have been conditioned to be Always On. It will take some practice and tweaking to refine your boundary ritual into a solid “OFF” switch in your work life balance efforts. Contact me if you would like some help building your own boundary ritual. PLEASE LEAVE A COMMENT and tell us what you will use as your boundary ritual and here’s to your success in creating work life balance.